DESCRIPTION: We are pleased to offer for sale this superb 4 bed larger style bay fronted terrace home, conveniently situated for Cheadle village center. Beautifully presented throughout the accommodation comprises entrance hall, lovely lounge, separate dining room, beautiful fitted kitchen, FOUR beds, and lovely bathroom with separate shower cubicle. Benefiting from Upvc double glazed windows throughout and gas central heating this property is sure to impress!! LOCATION: Bulkeley Road is situated approximately quarter of a mile from Cheadle village centre and all its attendant facilities. Cheadle offers a good range of shopping facilities catering for most everyday requirements. In addition John Lewis and Sainsburys superstores can be found approximately two miles away on the nearby A34 bypass. For the commuter, the North-West motorway network can be accessed approximately half a mile away. DIRECTIONS: From our Cheadle office proceed down the High Street in the direction of Stockport. Continue through the traffic lights and turn second right into Bulkeley Road. The property can be found on the left-hand side. Double glazed leaded bay window to front, decorative fireplace with tiled inlay and raised hearth, double radiator, polished wooden flooring, TV point, two wall lights, dimmer control, meter cupboard. Fitted with a matching range of stylish base and eye level units with worktop space over, 1+1/2 bowl stainless steel sink unit with single drainer and mixer tap, integrated dishwasher, plumbing for automatic washing machine, space for fridge/freezer, gas and electric point for cooker with extractor canopy above, double glazed leaded window to rear, double glazed leaded window to side, radiator, laminate floor covering, low-voltage ceiling spotlights, built-in boiler cupboard with wall mounted Worcester gas combination boiler serving heating system and domestic hot water. 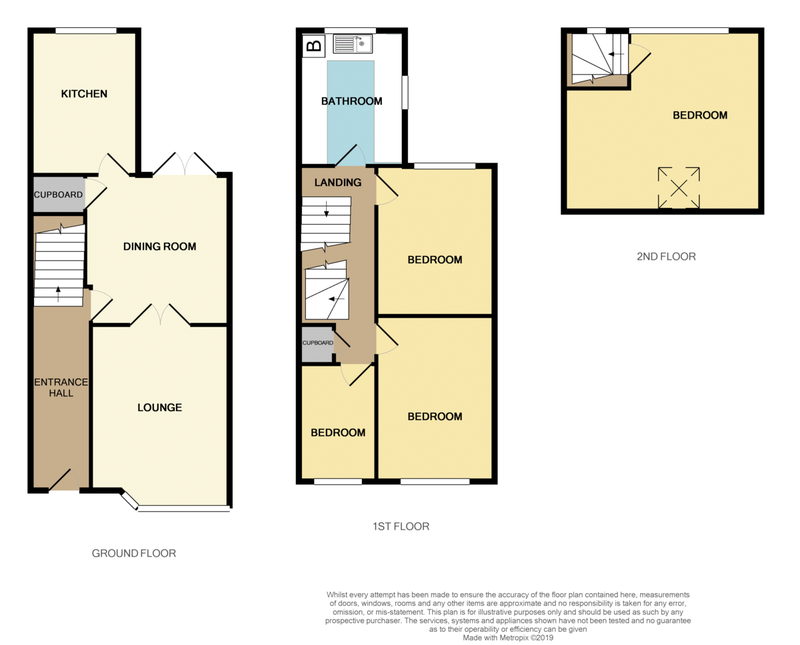 Fitted with four piece suite comprising large panelled corner bath, vanity wash hand basin with storage cupboard below, tiled shower enclosure and low-level WC, part tiled walls, heated towel rail, opaque double glazed window to rear, laminate floor covering. Double glazed leaded window to rear, single radiator in decorative cabinet. Double glazed window to front, double radiator, laminate floor covering, coved ceiling. Double glazed leaded window to front, double radiator, coved ceiling, laminate flooring. Double glazed leaded window to rear, double glazed Velux window to front, access to eaves storage front and rear, radiator. Low frontage with wrought iron railings, and an attractive enclosed, flagged rear courtyard with shrub/flowering raised planter borders, high fence, tap, lighting and timber shed.